As you may recall, last November I took part in the National Novel Writing Month challenge (write 50,000 words in 30 days). This helped me move my long-slumbering novel-in-progress from paper weight to actual paper. Once the contest was over, I took a little time to soak up my self-congratulatory celebration then got back to work. Getting back to work meant ironing out some of the rough spots, making first-round edits, and turning the thing loose to a couple folks that asked to read and review it (with the added bonus of editing it). I don't know what the average time it takes for the rewriting and editing process takes for a novel, but I can tell you it is a daunting task. There is no way I could have done it without the help of the folks that lent a hand! They'll be named in my acknowledgments once things get to that phase, for sure! As of today, I have officially "finished" my novel! I put that in quotes because if I choose to seek out an agent, editor, and go the traditional publishing route, then I am sure they will require that I do some editing. Then again, maybe not since I've gone through that already. You just never know how a certain editor will react. 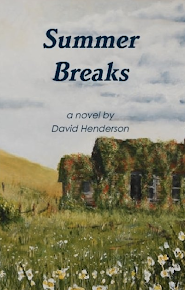 So, now the question that occupies my mind centers on whether I want to seek out an agent or go the self-publishing route like I did with my short story collection. There are benefits and drawbacks to each route. Agency means finding someone that I get along with and that really wants to work with me as we develop my writing career. There might be a lot of time involved, and there is the possibility of a false start or two. The upside is that if everything works out, it could launch a new chapter in my life. Self-publishing means I have control of the finished product. The downsides mainly involve distribution and publicity. Exposure will be much less in a self-publishing scenario, at least at first. There have been plenty of authors that have proved very successful going the self-publishing route. I'm just not necessarily a 'sales guy.' The novel is in a form that I am happy with. I had a member of my professional learning network on Plurk actually provide the cover art I'd like to use. The book is essentially print-ready from my perspective. Summer Breaks - After witnessing a horrific car crash in his neighborhood, nine year-old Corey Decker and his friends begin their summer break searching for a "madman" rumored to live in the woods nearby. I'll let you know which path leads to the published novel! If you've got any input, I'd like to hear it! Know an agent that might be interested? Feel free to pass my info along to them and/or their info on to me. Have a preference/recommendation as to the agent/self-publishing route, let me know.